Creating an online store is easy. Just choose a design, add your products and start selling! You don't need technical skills to build a successful Web store. Quick Shopping Cart makes it easy to create an eye-catching store that accepts credit cards, integrates with Google® and eBay® and offers multiple shipping options – all with no set-up fees! styles to find the best layout for your products. product associations, cross-sells and up-sells. Powerful features that are there when you need them. Quick Shopping Cart makes it easy for anyone to start their own online store, but it also has a rich collection of advanced features that allow you to enhance, manage and promote your store. NEW! Look amazing, even on your customers' smartphones. We automatically convert your Web store into a mobile masterpiece. 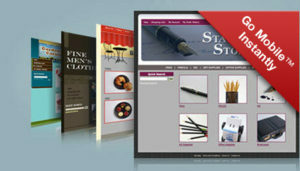 Select from over 1,500 design and color combinations, 14 Category page styles and 11 Product Detail page styles. Personalize with your logo, brand and product images. Make changes easily with click-&-type editing. Easily customize your navigation to integrate your store with your main Website. Navigate quickly and easily with a step-by-step Store Setup wizard. Add and manage product images, including enlargements. Deluxe and Premium plans support up to five images per product. Configure your product search options. Create nested categories to help your customers browse through your catalog. Accept all major credit cards through First Data Global GatewaySM, Chase Paymentech®, Intuit® Merchant Service Account, Authorize.net®, Innovative Merchant Solutions®, PayPal Express Checkout, PayPal Payments Pro, PayPal Payments Standard. Get real-time U.S. and international shipping rate quotes from UPS, FedEx and the USPS — or create your own custom shipping rate table. Use built-in shipping and tax calculators. Showcase featured products in your sidebar navigation. Specify multiple products for a rotating display. Create product cross-sells and up-sells that suggest related products (ie: "You may also like..."). Create coupon codes for an amount-off, percent-off or free shipping. Coupons can also require a minimum purchase amount. Create product bundles with special discounts. NEW! Boost sales by giving shoppers what they want: product ratings and reviews from other customers. Plus, watch your search results increase as your customer reviews provide original, keyword-rich content for search engines. Increase the visibility of your online store with search engine-friendly page URLs. Track the response of your marketing campaigns with auto-generated links that include your promotional code. See new orders, inventory status and member activity at a glance. Search and filter orders and export information to a Microsoft® Excel file. Capture credit card payments, enter shipping and tracking information and print shipping labels. Receive email notification for orders. FREE hosting with guaranteed 99.9% network uptime. 24/7 phone and online support. SSL Certificate enabled to securely process credit cards. PCI compliance verified by independent auditor. Offer easy and secure customer login and checkout. Website Builder: Combine your store with a content-rich website using one of more than 200 common designs. eBay: Quick Shopping Cart is a certified eBay listing tool. Google Product Search: Help customers find your products online. Microsoft Excel: Import and export data with ease. Atandra T-HUB: Integrate with QuickBooks, UPS, USPS, and FedEx with T-HUB multi-channel order manager. Pick a Plan that’s right for you. Whether you’re selling a few select products or more than 1,000, we have a plan that will handle all of your needs! FREE hosting with guaranteed 99.9% network uptime!